Jason Gardener is one of the UK’s all time great sprinters. For fourteen years Jason represented Great Britain at the highest level in the world of athletics. He was British Team Captain on numerous occasions. He was renowned for overcoming crisis situations when it mattered most. He achieved one of his ultimate ambitions at the 2004 Athens Olympic Games by winning Gold in the mens 4x100m relay. Earlier that year he became World Indoor Champion over 60m. He was also a four time European Indoor Champion over 60m, Commonwealth Games Champion for the 4x100m relay and is a member of the very select sub 10 second club for 100m with a personal best of 9.98 seconds. During his 14 year international career, Jason Gardener had to work hard on many occasions to get back into world class shape after injuries and operations caused setbacks. His perseverance and self belief kept him on track, winning championships right into the twilight years of his career. He was made the men’s team captain at the 2006 Commonwealth Games in Melbourne Australia. 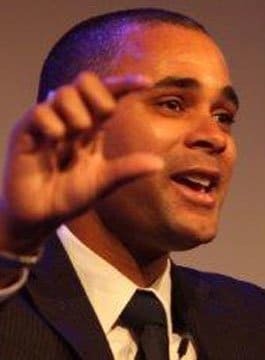 Since his retirement, Jason Gardener has gained an enviable reputation as an inspiring motivational speaker. He is one of a rare breed of athletes who can speak authoritatively and articulately about what it really takes to get to the top. Jason is a person who understands how to plan for success and achieve dream goals even in the face of adversity. Like any elite athlete, Jason has shown determination, discipline and sacrifice. Jason’s presentation includes impressive race footage, and a montage demonstrating the fine margin between success and failure. He takes audiences on an inspirational journey from childhood dreams of Olympic glory, through setbacks and disappointments until the moment he achieved his ultimate goal of standing on the winner’s podium in Athens. We asked Jason to do some motivational speaking to a team of senior managers in the Aviva General Insurance Operations team. His approach was professional and he ensured that he had a clear brief before our event. On the day he was punctual, appropriately dressed and very good company. His talk was very relevant focussing on team work. I personally found his presentation moving as we watched footage of the team winning the gold medal. Thank you Jason for speaking at our event, we received fantastic feedback from both staff and clients at our client conference. We found it extremely inspirational and it was delivered in a very natural and honest manner. We were all very proud to have met such a talented award winning athlete. We wanted to give a key message to our dealer network regarding determination and success. Due to our relationship with UK Athletics Jason was a natural choice. He was brilliant and conveying this key message and related it to our specific business need. Our dealers were much moved by Jason’s speech and the session proved to be extremely motivational for them. Furthermore, Jason went the extra mile by talking one to one with many of them individually. Jason made the event a huge success.